Beauty cream golden high quality for sensitive skin and rejuvenation based on hyaluronic acid turns with particles of gold in the background. Beautician makes facial massage with moisturizer for young woman. Portrait of a cosmetologist working with a client. 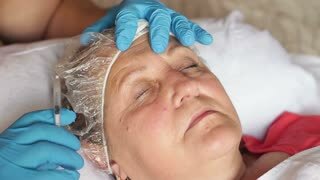 The beautician applies hyaluronic acid to the skin of the womans face. Close-up of cosmetologist rubbing hyaluronic acid into face of young girl. The process of applying a rejuvenating mask on the face of a young girl in a spa. The concept of cosmetology and skin care. Close-up of a beautician doctor in black sterile gloves opens an ampoule with hyaluronic acid before the rejuvenation procedure, in the background on the couch lies a young girl. Close-up portrait of a beautician girl who works with a client in a Spa salon. The view from the top. 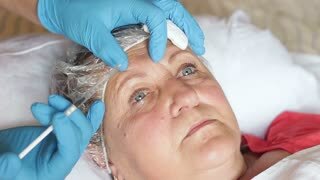 The process of rejuvenating procedures with hyaluronic acid in a cosmetic clinic.